When it comes to your home’s entry or patio doors, you want doors that look great and will give you many years of trouble-free operation. 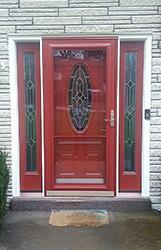 Energy Swing Windows installs new exterior doors in styles and materials to fit your needs. Our professionals will handle the entire process from start to finish – from helping you choose the right type of door to the actual installation. Call us today at 1-844-385-9318 or fill out our online form for a free no-obligation estimate. If you live in Bethel Park, Monroeville, West Mifflin or nearby areas in Pennsylvania, let us help with your home remodeling project! 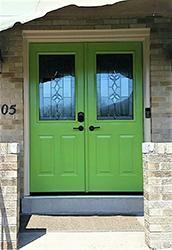 Entry Doors: Everyone wants their home to make a great first impression, and the front door is vital to that goal. 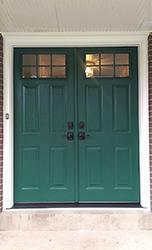 We install replacement entry doors in a variety of styles and materials to ensure that you get the exact look you want for your home. Patio Doors: Patio doors are a great way to add natural light and complete the appeal of your patio or deck. 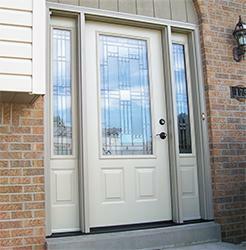 We offer sliding and French doors that will open up your home to the outside and create a beautiful entryway. Storm Doors: Storm doors are a popular addition for many homeowners, as they can create more natural light and ventilation in the entryway. 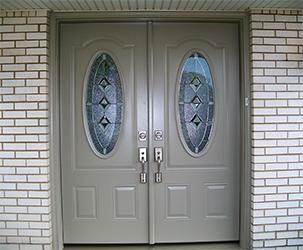 We offer a variety of styles of storm doors to complement your front door and give you the look you want. 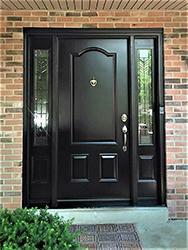 Door Materials: We offer vinyl, fiberglass, wood, and steel doors. Each of these materials provides some variations on durability and maintenance level, but all offer a beautiful finished appearance once installed. 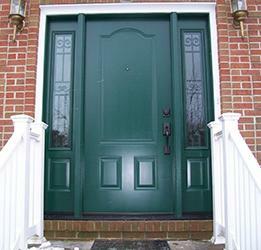 We will help you find the right door material for your needs. This couple in Latrobe, PA came to Energy Swing Windows because their sliding glass door was heavy and sticking. They opted to change the style from a sliding glass door to a beautiful french door with internal blinds. The result is stunning and the customers were thrilled with everything. Our client in Latrobe, PA wanted to replace their aged entry and storm doors to improve the appearence and energy efficiency of their home. The elegegant wooden door and its beautiful glass design look fantastic. 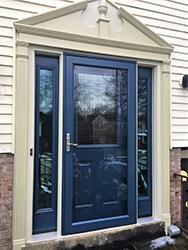 Our Energy Swing Windows team installed the new ProVia doors and the customers were 100% satisfied! 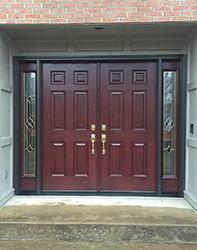 What a difference a new door makes in this Homer City, PA home. 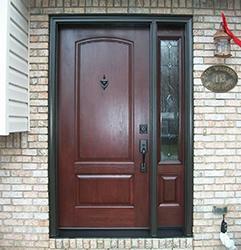 This homeowner updated their front entry door with a brand new door from Energy Swing Windows. Plus, they decided to get rid of their old storm door so the beauty of their new door could be in full view! This homeowner chose Energy Swing Windows to work on her home for a third time, this time to install a beautiful new custom entry door. 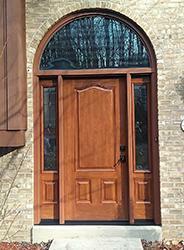 Energy Swing Windows recently installed a new Entry door with sidelights for a repeat customer in Greensburg. 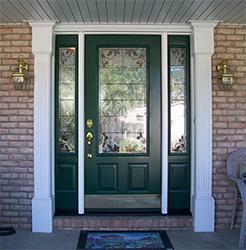 The beautiful door brightens up the porch for an inviting look. After the work we did on their entry door peviously, our customers in Greensburg knew there was no better team for the job of replacing their sliding glass door. 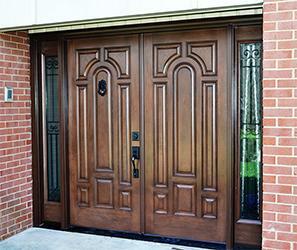 Although they live in a very new, beautiful home, the quality of their original doors were builder grade. They were looking for something sturdier, that would last them for a very long time. We replaced the door with a new version made by ProVia. Once again, our customers were pleased with our dilligence and cleanliness during the short process. 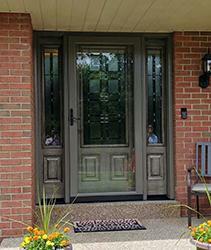 Our new client in Greensburg was impressed with the sliding glass doors on our mailers. After hearing her consultant's proposal, she knew Energy Swing was the right company for the job because of our distinct sales process and small business mentality. Her patio door, as well as a few windows, were outdated and required replacement. Our installation team replaced her patio door with this beautiful sliding glass door made by ProVia. The sliding glass door was made with the blinds between the glass for simpler and more efficient functionality for the client. She was thrilled with the end results of the project! Our new customers in Greensburg called on Energy Swing Windows for their patio door replacement project because of the pictures they saw on our mailer. They turned their old, swing in patio door into a beautiful sliding glass door. The sliding glass door allows the customers to have more room inside because the swing in door is no longer in their way. 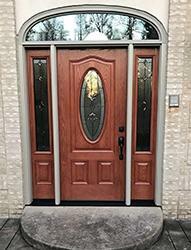 They were very happy with the installation and look of their new door. One of our customers located in Greensburg, PA called upon Energy Swing Windows to replace their front entry door towards the end of last year. This year, they gave us another call because they wanted to replace their patio door. They decided to match the patio door with a similar look to the entry door and it turned out beautifully! They went from plain white doors to elegant black doors with gorgeous glass designs giving their home a completely different look! Our client in Greensburg wanted to get an updated look from what they had. They liked the white interior and the small decorative glass in the middle, but the door needed a new makeover. It was showing signs of aging. We offered a brand new white ProVia Entry door with oval decorative glass that gave the whole entry way not only a brighter look but updated it as well. It was exactly what our client was looking for and we are happy we were able to make it happen. This old front door wasn't doing much for the curb appeal of this Greensburg home. Being current customers of Energy Swing Windows, the homeowners already knew where they needed to go for their door replacement project. Our expert design consultants help guide them towards the perfect door for their home. The customers were ecstatic with the end results! 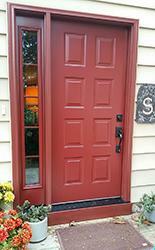 Our client had an old door with a distinctive color. 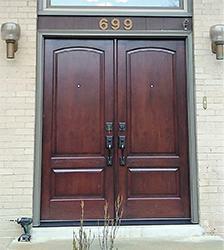 They were hoping to find a door that better suited the style they wanted for their home. They heard good things about Energy Swing Windows and were impressed with their no pressure sales. They created the ideal for them, and the finished product is just beautiful! 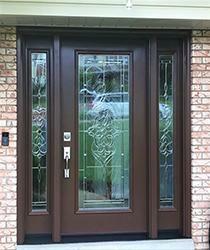 The owner of this home in Greensburg, PA trusted Energy Swing Windows to upgrade their entry door from outdated and weathered to new and inviting! 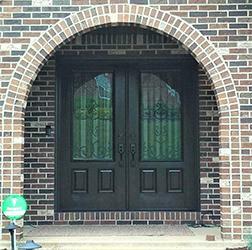 The door's beautifully designed glass goes perfectly with the home's aestichally pleasing archway enterance. 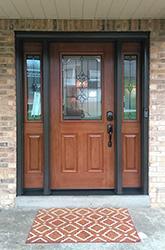 Our client was 100% satisfied with their new door and the attentive installation process provided by our team. Our loyal customers in Grindstone were tired of their old patio door. The paint was peeling, the handles were rusting, and it was letting water in. It was time for an update! Energy Swing Windows got them set up with this beautiful patio door by ProVia. The door has a sliding screen door, allowing some of that fresh, country air to come into the house at the customer's convenience. They were thrilled with the way everything turned out! Our client located in Jeannette, PA wanted to replace nine double-hung windows and a sliding glass door in their home. They chose to upgrade the extremely dated sliding glass door with some beautiful, stylish French double doors that give the patio area an elegant and modern vibe! 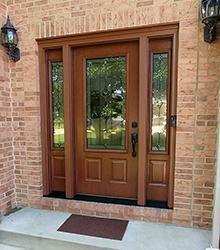 Comfort & efficiency: A warped, drafty door can make your home uncomfortable and cause your energy bills to rise. A replacement door that's properly installed and sealed will help keep the temperature in your home consistent and reduce the load on your heating and cooling systems. Finding the right door for your home is part of the process, but no door looks complete without the right finishing touches. We install unique knobs and handles to give you a custom look, and we supply a variety of colors for your door. 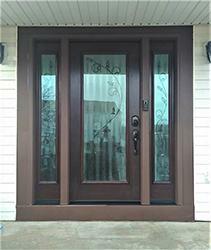 Adding decorative glass, transom windows, and sidelights are all great options for improving the look of your door and giving you an eye-catching entryway. "We had Energy Swing Windows installed by a Maryland Contractor. One of the..."
We had Energy Swing Windows installed by a Maryland Contractor. One of the windows had a problem and even though the Energy Swing Windows Serving Greater Pittsburgh, Murrysville, and Washington does not service this area they helped in making our window, that needed to be repaired, a painless experience. Thank You Ron! Your company is very dependable and returns phone calls. Quick, easy and efficient work. "Very thorough and knowledgeable with their products"
By Ed & Bobbi G.
"Quality of door and excellent quality of installers workmanship (are..."
Quality of door and excellent quality of installers workmanship (are reasons we would recommend Energy Swing). "Very professional. Price was right and installers did super job." By Frank & Jeri D.
"Everyone from Kelly, Jessica, Don to the installers, Eric, Bill, Fred and..."
Everyone from Kelly, Jessica, Don to the installers, Eric, Bill, Fred and Herb was so polite and helpful. You can tell they CARE about you and each other. "I love the door. The overall look is so "polished"." By Jim & Lynne M.
"The cost came in considerably less than Anderson Renewal for the same..."
The cost came in considerably less than Anderson Renewal for the same door, same job. The friendliness and knowledge of the salesman Chris and the customer interface, Kelly. By William & Lauren C.
"Great customer service and excellent product!" By Keith & Marcee R.
"Honest and straight forward way of doing business." "Chris was a great! He is very knowledgeable and courteous." Chris was a great! He is very knowledgeable and courteous. "Very professional, very friendly to my 4 year old "
"The people are thorough, effective communicators, kind, consistent,..."
The people are thorough, effective communicators, kind, consistent, patient, thoughtful, strong work ethic, professional and knowledgeable. The product is excellent quality, visually attractive, updated and easy to maintain. 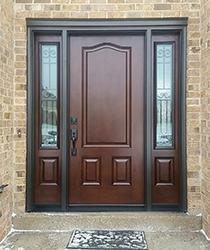 Our doors are custom ordered to ensure a perfect look and fit every time. Contact Energy Swing Windows today to learn more about our door replacement services and to schedule a free consultation! 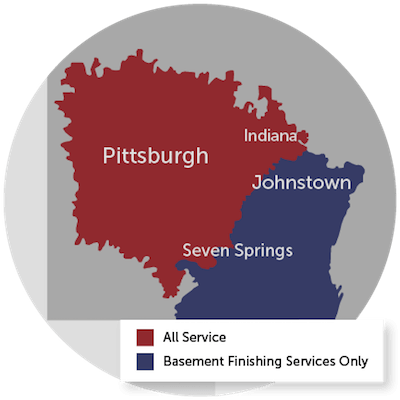 We're the area's window and door experts, serving Monroeville, West Mifflin, Bethel Park, Irwin, McKeesport, Coraopolis, New Kensington, Greensburg, Export, Trafford, Canonsburg, Latrobe, Bethel Park and many areas throughout Pennsylvania.